As mobile devices start replacing traditional laptops and desktops, it's natural for people to chafe at the limitations on storage. The Patriot Aero provides an excellent, if not quite elegant, solution to this problem. Most portable hard drives lack glamour. They're tiny workhorses, useful for doing backups and transporting large files and little else. Patriot's Aero goes way beyond those basics, offering WiFi connectivity, tablet compatibility via custom apps and a rechargeable battery. This versatility may not seem useful at first, but we think that's more due to lack of imagination than lack of utility. A product like this, with the ability to do so much, opens up possibilities you hadn't really thought of before. Its limitations, like limited documentation and a somewhat confusing user interface, though, make it suitable only for those willing to work around the rough edges. 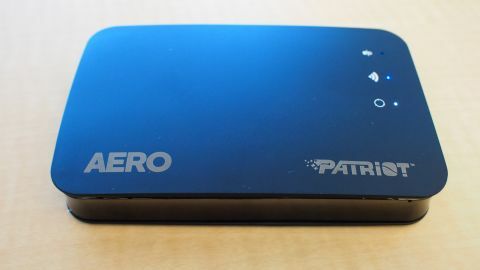 The Patriot Aero is 8.6cm (D) x 13.9cm (W) x 2.44cm (H) and weighs 295 g. That's a bit larger and heavier than some portable drives, but most portable drives don't include a rechargeable battery. The Patriot Aero's lithium-ion battery can deliver up to six hours of continuous streaming. The unit charges with a standard cell phone charger, reducing the number of things you need to bring on a road trip. What's a rechargeable hard drive good for? For one thing, if you're using it as an external hard drive for your laptop, hard drive access won't drain your laptop's battery. There are a lot of other uses, though, which might not immediately come to mind. For instance, you could use it as a portable media server on a bus or car trip or while camping. Like we said, what sets the Patriot Aero apart is its versatility. As you'd expect, it offers the basic functionality of a portable hard drive. You can connect it to a PC using the standard USB 3.0 or USB 2.0 interface. This USB connectivity, though, is mutually exclusive with its most impressive feature: WiFi connectivity. Unfortunately you can't use these two features simultaneously; enabling one disables the other. In WiFi mode, it can function as a network file server or as the WiFI hub of a mini network. It's easy to imagine where that might come in handy. For instance, if you have a group of laptops in a hotel room and need to share large files, the Aero would be a perfect impromptu file server. The Patriot Aero also functions as a bridge to the wider Internet. Acting as a WiFI access point; you connect your computer or tablet to the Patriot's WiFi network. The Aero can connect up to eight devices at the same time. You then connect the Patriot to your WiFi router which is connected to the Internet. The Patriot Aero passes through your Internet traffic to the Internet-connected router. This has some upsides; you can use the patriot to extend your WiFi range, for instance. There are some downsides too, however. We noticed some performance degradation in download speeds using this setup. There are some serious limitations, though, if you are trying to use this as a network drive. The main one is the lack of Ethernet connectivity. The only way to link it to your network is via WiFi. That's inherently less secure and less fast than an Ethernet connection. But the Patriot Aero is designed mainly for use with mobile devices; that's where it really shines. What really sets the Aero apart is its ability to connect with tablets and other mobile devices. The company has apps available for iOS, Android, and the Amazon Kindle Fire which let you use the Aero as a file server. This lets you get beyond the tight storage limitations of a portable device. Though this is most useful for streaming high quality video or storing large music collections, but there are many other possible uses. For instance, if you had a large archive of digital books in PDF format, large PowerPoint presentations, or even of photos. The basic process is that the Patriot Aero becomes your WiFi access point. You connect your mobile device to the Patriot and then use the Patriot Connect app (or a web interface if you are connecting via a PC) to configure the Patriot to use your WiFi router to connect to the Internet. This second step isn't necessary, though. You can use the Patriot as a local file server without also connecting to the Internet. Once connected, we found the file serving functionality to work quite well. The easiest way to watch videos or listen to music from within the Patriot Connect app. However, with a little configuration, you can also use any SAMBA-compatible app to access the files on the hard drive. You can also copy files back and forth from the mobile device to the hard drive. As we mentioned previously, the requirement that you connect your mobile device to the Patriot and then access the Internet via pass-through causes some degradation in speed. It's also an inelegant solution, since you need to switch your WiFi connections to the Patriot when you want to access files and away from it when you don't, since you won't want to take the performance hit. The flexibility of this portable hard drive with WiFi connectivity and a rechargeable battery. We also liked native app support iOS, Android, and Kindle Fire. Confusing user interface and very limited documentation. The WiFi pass-through also causes a sacrifice in speed when connecting to the Internet. As mobile devices start replacing traditional laptops and desktops, it's natural for people to chafe at the limitations on storage. The Patriot Aero provides an excellent, if not quite elegant, solution to this problem. It takes some time to configure and to determine how best to use its many capabilities, but once mastered it opens up a lot of possibilities.